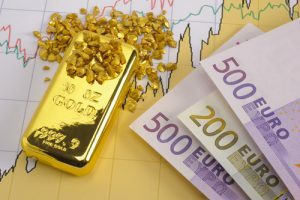 Gold futures rallied to a two-year high, snapped a five-session losing streak, and advanced for their fourth straight weekly increase as investors ran to safe-havens the day after the UK voted to leave the European Union (Brexit). Gold for August delivery tacked on $59.30, or 4.7%, to settle at $1,322.40 an ounce on the Comex division of the New York Mercantile Exchange. The settlement is the highest since July 11, 2014 when the yellow metal ended at $1,337.40 an ounce. "(Brexit) benefits gold because in a general risk-off mode, it’s a natural safe haven for everybody," Reuters quoted Marie Owens Thomsen, chief economist at Indosuez Wealth Management. "Now that the UK has voted to leave, we think there’s a higher probability that the $1,350-1,360 per ounce level can be breached, and we’re therefore looking for an extended target in the $1,400s." "Twenty-two analysts and traders took part in a survey of market professionals. Sixteen, or 73%, said they were bullish. The lower and neutral camps each drew three votes, or 14%. Meanwhile, this week’s Kitco’s online survey received 470 votes. A total of 290 respondents, or 62%, said they were bullish for the week ahead, while 126, or 27%, were bearish. The neutral votes totaled 54, or 11%." Extending its winning streak to four sessions in a row, silver for July delivery surged 43.6 cents, or 2.5%, to settle at $17.789 an ounce. The close is the highest since April 29 when prices ended at $17.819 an ounce. Silver futures also advanced their weekly gains to four straight, climbing 2.2% this week after edging up 0.5% last week; 5.9% the week before then; and 0.6% for the week ended June 3. For the year to date, the precious metal is higher by $3.99 or 28.9%. July platinum added $20.80, or 2.2%, to $987.10 an ounce, rising 2.2% from last week. Palladium for September delivery fell $19.45, or 3.4%, to $546.45 an ounce, trimming its weekly gain to 3.2%. Year to date, platinum is 10.5% higher while palladium is 2.8% lower. Gold jumped $53.35, or 4.2%, to $1,315.50 an ounce. Silver surged 75 cents, or 4.3%, to $18.04 an ounce. Platinum added $24, or 2.5%, to $987 an ounce. Palladium declined $12, or 2.1%, to $548 an ounce. Their weekly advances tallied to 1.9% for gold, 3.9% for silver, 2% for platinum and 3.2% for palladium. Gold coin sales advanced 21,000 ounces after rising by 19,500 ounces last week. The weekly splits include 18,000 ounces in American Gold Eagles compared to 16,500 ounces previously, and 3,000 ounces in American Gold Buffalos to match the prior week. Silver coin sales advanced 517,000 ounces this week after climbing by 474,000 ounces previously. This week, all sales came from American Silver Eagles. Last week, sales splits included 468,000 ounces in American Silver Eagles and 6,000 ounces in Harpers Ferry Five Ounce Silver Coins. The U.S. Mint set this week’s allocation of American Silver Eagle at 2,204,500 coins. Bullion distributors ordered 23.5% of them. Despite a couple of lagging weeks — the latest weekly sales total is the second lowest of the year while last week’s total ranks at the bottom, 2016 American Silver Eagles are running at a record pace with sales of 25,312,500 coins. The level is 25.2% higher than those sold through same time in record-breaking year 2015. Gold would go up major time just 7 days before Nancy’s $10 gold coins are issued. The Mint will make a major profit on them as they bought the gold for these at less than $1249 per ounce. With Platinum at $328 lower than gold per ounce now (& depending on what it does by this Wednesday) the 2016-W Proof Platinum Eagle coin issued on Friday will be a bargain even with a high 10,000 mintage at 2.5 times higher mintage than last year’s issue that was limited at 4,000 coins. Such a deal !